Ananka's Diary: Creative, Yes. Hygienic, Not Exactly. 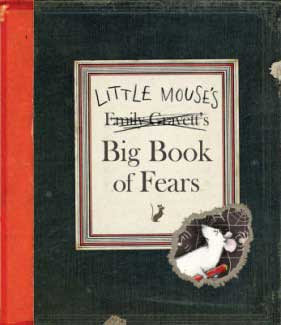 Emily Gravett's award-winning children's book, Little Mouse's Big Book of Fears, was created with the author's blood, sweat, and tears--and another extra-special ingredient. Gravett wanted the pages of her book to look as though they'd been nibbled on by mice. So she let her two pet rats, Button and Mr Moo, go to town on a piece of paper. They nibbled all right, and after lunch, they decided it was time for a bathroom break. Their urine colored the page yellow, giving it a "properly ratted" look that Gravett loved. So she scanned the chewed-up, peed-upon page and used it as the background for her illustrations. Smart AND disgusting! I love it! Uh . . . okay. That's cool.Ish. Where's the Kiki 3 excerpt? Please? I say cool, the divas at my school say "oh god! ", and the other people say I need therapy. Either way, WE MUST ALL SEE THE EXCERPT! YES! BRING ON THE EXCERPT! I like Emily the strange.